I find that a general problem with K-dramas that are based solely on romantic relationships and the getting together of two people is that romance alone can’t sustain a story; there has to be other elements. With sageuks in particular, a lot of writers often times feel the need to fill their stories with a certain amount of politics — almost to fulfill a quota — or else, hey, their dramas would just be regular ol’ dramas. And that’s what I’m starting to feel with The Moon That Embraces the Sun: what the writer of the original source material really want is for King Hwon to mack at it all day with Yeon-woo, but because they can’t, he’s gonna throw in a bunch of plotting ministers and rich nobles taking advantage of The Common Folk so that it feels somewhat historical, and call it a day. I love the relationship between Hwon and Yeon-woo, but I am wary already of how much fluff we’re going to have to sit through in order for the two to get together. It would be fine if the fluff were well-written and well-acted, but it’s not, so I’m gnashing my teeth a bit. First, let’s start with the acting. While the children actors were all good in their own right, I suspect that a huge portion of why they’re hard to let go of is also because the mood was a lot lighter when the children were around. There was some doom n’ gloom, but it was pretty restrained, given that the writers didn’t try to take all of them to that dark place we called angst for an elongated period of time. It’s easier to like them and to be lenient with children acting when the tone is fun and the story is light. Now that we’ve graduated into the adults, however, I’m feeling a little less enamored and a little more critical, because the story is calling for more. It seems like some of the characters are not designed to be likeable, no matter how well the actors/actresses play them (Kim Min-seo playing Bo-kyung, for example), and some characters became more likeable regardless (Princess Min-hwa). But then, there are the characters that are supposed to be likeable, yet feel like diluted versions of themselves now that they’re grown up. The adult cast feels all over the place, ranging from the really, really bad (Song Jae-rim playing adult Woon) to the really good (Kim Soo-hyun playing adult Hwon), and they’re all acting with each other so I’m extremely distracted by how much of an imbalance in skill there is. Case in point: whenever Kim Soo-hyun reveals his innermost thoughts as an uncertain king to Song Jae-rim. The Woon character could be so much more (and is so much more, if we’re going to go by the original source material) if the actor playing him were more nuanced and gave more life to his character. No actor acts within his or her own bubble, so no matter how good an actor, acting alongside a bad actor most definitely has an impact on how a scene plays out. Fine, I can overlook Song Jae-rim because Woon, while important, isn’t that important. But what of Yeon-woo, played by Han Ga-in? Han Ga-in is one of my least favorite popular actresses and I have a huge irreversible gripe with the fact that she drains all energy from the scenes she’s in. I watched this happen for 17 episodes in Bad Guy and she’s freaking doing it again in Moon. I don’t think she’s a bad actress — there are many who are way worse than she is — but she’s acting alongside actors who are many, many times better than she is, and she’s just not enough. She was not enough when she was acting alongside Kim Nam-gil and Kim Jae-wook in Bad Guy, and it’s almost painful to watch her be so blank in a scene with Kim Soo-hyun, when Kim Soo-hyun is always so loaded and in touch with his character’s emotions. It also doesn’t help that she has no chemistry with either Kim Soo-hyun or Jung Il-woo, and has a history of not having chemistry with her male leads. It becomes palpable when Kim Soo-hyun or Jung Il-woo have to work around Han Ga-in’s amazing blankness and thus can’t be as good as they possibly can be. Another case in point: there have only been two scenes thus far between Jung Il-woo and Kim Soo-hyun, one when they meet again after Yang-myung has come back from traveling, and two when they dine together. In the first scene, they say so little to each other but convey so much. 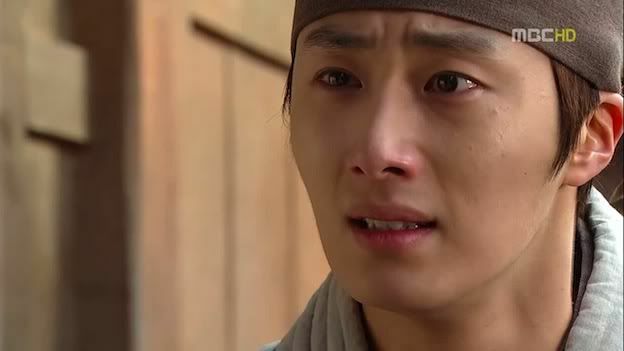 In the second, the mood goes from flippant so quickly into somber with a mere question from Hwon regarding whether or not Yang-myung “still thinks about that girl.” The seriousness of the question and the intonation and line delivery from Kim Soo-hyun forces Jung Il-woo to react and deliver his lines a certain way, which is what creates the somber mood. SEE WHAT I MEAN? It really doesn’t bode well that Han Ga-in is so central to this storyline yet her work is what it is. Like I said, I don’t think she’s bad, I just think she’s nowhere near as strong as her male counterparts. Because there is no arch or central conflict to guide us through the story other than the getting together of two ill-fated lovers, a story of this kind so often becomes just the pushing and pulling of these two lovers together and apart until they’re finally together. These are the most popular kind of stories and maybe the ones that resonate the most with audiences, but they’re also the least innovative. Who doesn’t know how Moon is going to end? Who doesn’t know who’s going to get the girl, who’s going to end up with heartbreak, who’s going to do questionably moral things to attain their goal? This is just an age old tale dressed differently with another set of metaphors and another set of actors. I fully admit that it is exactly because this is the kind of story I know best that I’m addicted to knowing what happens next: because what I anticipate will happen will actually happen, and thus I am rewarded for knowing how the story plays out. It’s human nature. But I also know why Moon, at the end of the day, is not really satisfying writing-wise because there is nothing bigger. The plotting ministers all feel like caricatures. The evil grandmother and the scheming Queen are unconvincing and so twirly-mustache-evil that there’s no doubt they’re going to lose in the end, so there’s no sense of suspense or urgency when obstacles arise. That takes so much out of a good and evil story. 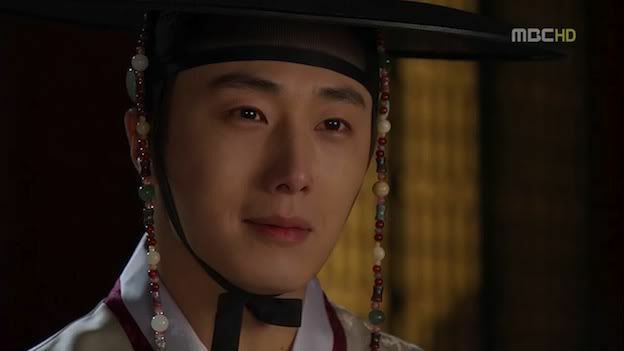 I know we’re only eight episodes in, so I hope that the story develops more and that the writers pack more meat in the obstacles that come King Hwon’s way, because as it is now…whoooooooo caaaaaaaares? Sigh, so much tragedy is headed towards thy bromance. her acting has never connected with me so i was pretty unhappy when HGI got casted. but i thought that at least she’d look perfect for the role, right. however, actually seeing her act with the boys, she just looks so disconnected and zilch on the chemistry.